Books about kids are often bestsellers because American parents are willing to spend money to cover every base to ensure their offspring get ahead in life (see: Chua, Amy and Druckerman, Pamela, among others). Well, so long as parents can afford to buy books. Because even in a society where equality of opportunity is supposed to reign supreme, in the buying of the books (by hard-working, well-intentioned, and affluent parents) the children of those parents get even further ahead. Putnam’s findings may have the same effect, though his stated purpose is to reduce the opportunity gap through better schools, better families, and better communities. Drawing on an impressive array of interdisciplinary research, Putnam connects quantitative data with qualitative stories to illustrate how children at the top and bottom are growing up in America today. Chapter 1, “The American Dream: Myths and Realities,” does this the best of the six chapters. Putnam begins by telling the story of his hometown—Port Clinton, Ohio—and how it reflects the two divergent Americas that have developed since his own adolescence in the 1950s. Through careful parsing and presentation of data Putnam zeroes in on education as a major part of the reason why social class has become a constraint on opportunity. While Our Kids centers its data and stories on the major social institutions of families, schools, and communities, the heart of the story lies with the American educational system—broadly defined as those places where the kids actually are, from early education (including childcare) through graduate school, and all other aspects associated with it like sports and the arts. Because education is so much the focus, appearing prominently in the chapters on parenting and community as well, Putnam might have organized the book differently. For example, the four example chapters could have focused on early education, grade school, secondary school, and higher education. Though no one villain is identified in Our Kids, Putnam makes it clear that if you care about equality of opportunity, American democracy is failing our kids. But if a villain can’t be named, who should be addressed? While Putnam names a few concrete steps people could take to help reduce inequality in their communities (like urging their superintendents to eliminate pay-to-play activities at their local public high schools) it is also quite likely that his readers already have their own children and perhaps even grandchildren. Once that has happened human instinct is to want the best for one’s own offspring. Perhaps the key is to direct this type of work to college students, people in their twenties who haven’t yet started families. Writing a book directed at that age group would show how and why they should change the country for the betterment of everyone (including their own future offspring). 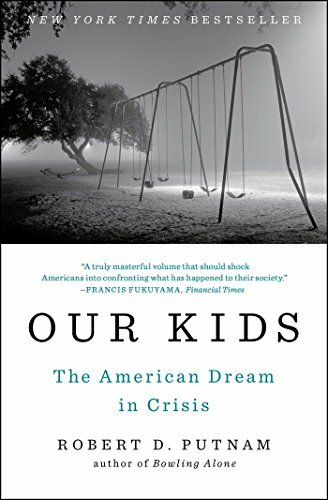 Until Putnam, or one of the many talented researchers whose work he describes, writes that book, Our Kids is a needed addition to the shelves of thoughtful parents and citizens, affluent or not. Hilary Levey Friedman teaches social sciences at Brown University. Her expertise is across across a broad arc of topics that include pop culture—specifically including beauty pageants, reality TV, dance competitions, competitive afterschool activities, youth sports, and parenting. She is Book Review Editor at Brain, and Child magazine and author of Playing to Win: Raising Children in a Competitive Culture.